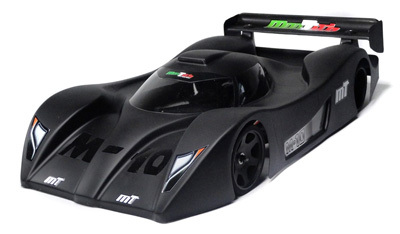 The Montech M-10 WGT/GT10 pan car body in 200mm width. Extremely low and sleek this Montech body is unlike many WGT/GT10 bodies on the market with its multi layered wing. The body is moulded in 0.75mm polycarbonate and includes window masks, decals and wing mounted hardware. BRCA Recommended for use in GT10 Nationals. Produktet blev oprettet mandag 30 marts, 2015.